Where else on planet Earth do you have to watch for iguanas and donkeys crossing the road? Where else will you see flamingos in the wild on a daily basis? Or green parrots or yellow trupials? How about the Green Lora or the other 190 or so species of birds that live on the island? 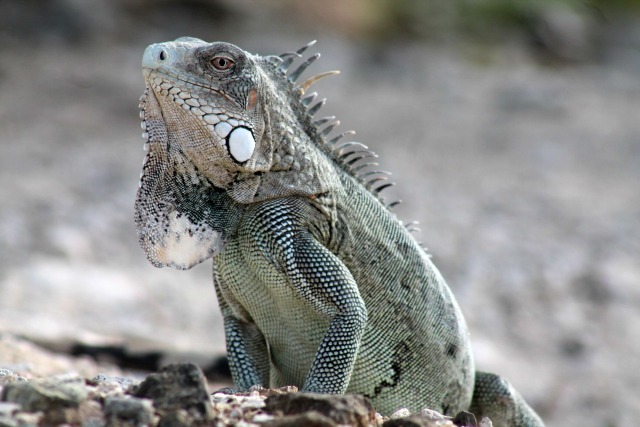 And that’s not to mention the incredible array of fish and coral on Bonaire… Spectacular nature, hiking trails, biking trails, endless possibilities await… Bonaire is a nature lover’s paradise. Walking, biking or driving around the island you will be amazed by Mother Nature all around you. From turquoise waters. coral and tropical fish seen right at the seaside to yellow-shouldered parrots, egrets, herons, yellow bananaquits, iguanas, goats, donkeys… tropical plants and flowers, palm trees, and and an endless landscape of cacti. 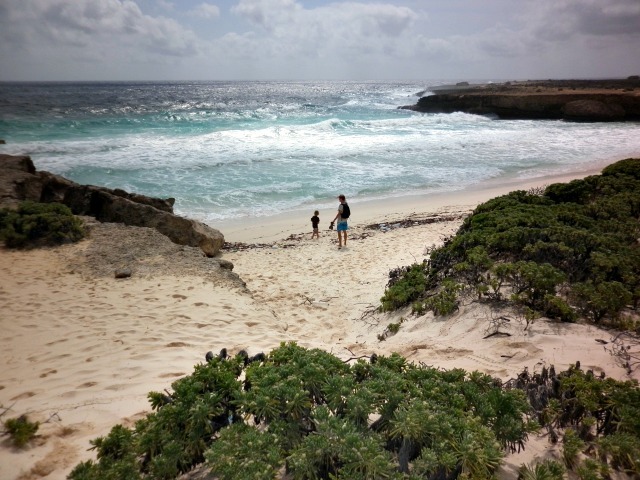 The rugged terrain of Bonaire is fascinating for adventurers and explorers but also a peaceful place to get away from it all. If you plan to visit the national park (and you should! ), plan to get up early and spend the day. We love driving the “long” route which makes stops at various beaches and takes a good 4 hours. Oftentimes you will be the only visitor at the beach you stop at. The one pictured above is not a swimming beach – the currents are too strong, but there are a few choices of absolutely remote and gorgeous beaches within the national park where you can swim, snorkel and dive. Bring snorkel gear, food, towels, sunscreen/ rash guards and plenty of water. There is a restaurant near the end of the long route at Boca Slagbaai but it is open on again and off again so be prepared with your own food and water. If it is open it’s a beautiful location to stop, have a drinks or a meal and go for a swim. 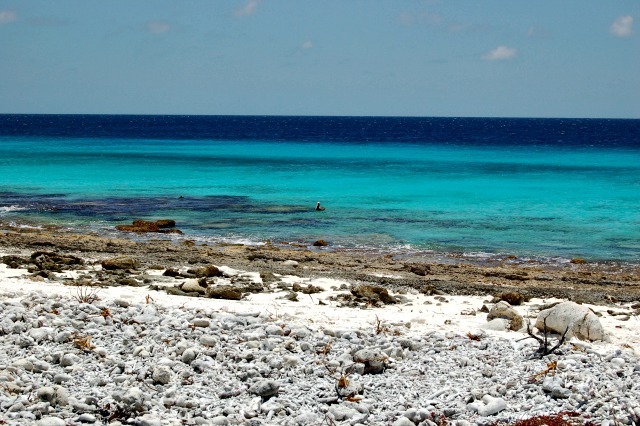 Typical Bonaire coastline consists of LOTS of coral like in the photo above, with the coral reef right at the shore line, crystal clear turquoise waters and a maybe pelican enjoying the catch of the day. This shot was taken along the south road near the salt factory. We highly recommend taking a long leisurely drive (Or LONG, but invigorating bike ride with plenty of water) on the South road, EEG Boulevard, to check out the salt factory, the kite surfers, Pink Beach – and continue all the way down to the Southern light house and then arrive for a refreshing drink at either Jibe City, Bonaire Windsurf Place or Sorobon Beach Resort, all located at Lac Bay. On the way back toward Kralendijk if you take Kaya IR Randolph Statius Van Eps to complete the loop, and if you are on a bike, you will have the wind at your back and an easy ride back home. How can this many natural wonders exist on one tiny island? Flamingos are commonly seen on Bonaire. 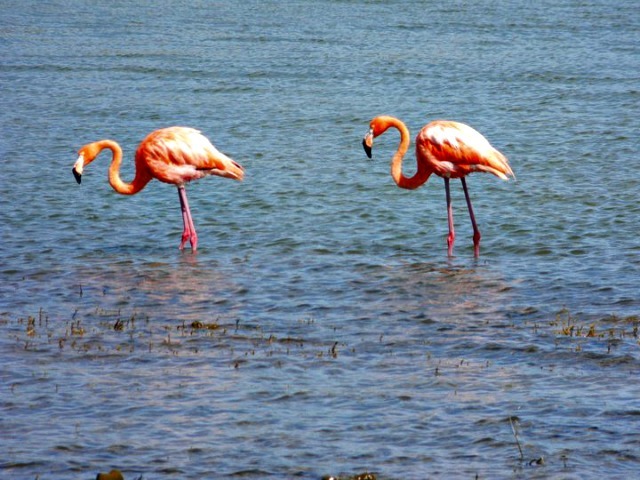 A few areas of the island are much more populated with flamingos than others. The Pekelmeer Flamingo Sanctuary is one of only four areas in the world where Flamingos breed. These pink salt lakes (near the salt factory on the South end of the island) get their color from tiny rosy brine shrimp in the water. The Pekelmeer is home to more than ten thousand flamingos. It is not uncommon to see flamingos flying over Lac Bay. Kaminda Sorobon, the long windy road leading towards Lac Bay also is a good spot for flamingo watching. Tourists may view flamingos from the road as it’s not permitted to damage their habitat by getting too close; a good pair of binoculars is recommended. For more on Flamingos and some scenic natural wonders of Bonaire check out this video made by Royal Caribbean.